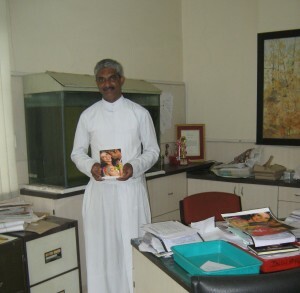 Hiccups being received by Fr Andrew Fernandes, S.J. currently Principal, St. Vincent High School. Fr Andrew knew Harsh and had observed Harsh during his schooling and remembers him fondly. It was here at St. Vincents that Harsh started writing articles for his school magazine and gradually developed his writing skills, culminating finally in the creation of his novel Hiccups. Hiccups is now present in the library of St. Vincent High School for all Vincentians to read. This would have been a really proud day for Harsh. He loved St Vincent’s from all his heart and now HICCUPS a part of his legacy is waiting in the library for fellow Vincentians of all ages to read in the coming years.